It is twenty years since the execution style killing by the SAS of three IRA members in Gibraltar. In Northern Ireland these deaths sparked a brief but particularly bloody upsurge in violence. Over the next thirteen days a series of attacks involving the army, the IRA and loyalist paramilitaries left a further eight people dead and 68 injured. Two of these incidents will be vividly remembered by those who were around at the time, if only because they were captured live by TV cameras on the scene. One was the attack by lone loyalist gunman, Michael Stone, on mourners attending the funerals of the Gibraltar victims, which left three mourners dead and scores injured. The image shown repeatedly on that day’s news bulletins of Stone fleeing through West Belfast’s Milltown cemetery towards the M1 motorway, attempting to hold off a chasing crowd with pistol shots and grenades, provided a stark illustration of the brutal reality of the Northern Ireland Troubles. So did the footage taken three days later on the Andersonstown Road at the funeral of one of those killed by Stone in Milltown. This was of two plain-clothes British soldiers, who had driven aggressively into the funeral procession, being dragged by the crowd from their car, one brandishing a handgun. Shortly after this, they were handed over to the IRA who took them to waste ground behind nearby shops and shot them. Today, twenty years on, Sinn Fein put a huge effort into organising a series of high profile events to commemorate the Gibraltar killings. There were rallies and a large public meeting in West Belfast. A special 12-page commemorative supplement on the killings and their bloody aftermath was produced and distributed through doors in Catholic areas of the city. Public controversy soon developed over these commemorations, especially over the proposal to host a celebration of the life of Mairead Farrell, one of the three shot by the SAS in Gibraltar, in the Long Gallery in Parliament Buildings at Stormont. This produced a predictable knee jerk reaction from the Democratic Unionist Party (DUP), who announced an event to celebrate the role of the SAS to be held in the same venue and at the same time. In the end, neither party got their way – new rules were rushed through in haste to make it more difficult to book the Long Gallery – and Sinn Fein went ahead with a low key meeting on Mairead Farrell’s life in their own offices at Stormont. For Sinn Fein and the DUP, all this ritualised sectarian mud-slinging has much more to do with what is happening now than with the events of two decades ago. Northern Ireland’s sectarian parties have always had a simple rule of thumb – whenever you get into trouble, invoke the past. And serious trouble is looming visibly on the not too distant horizon for both Sinn Fein and the DUP. For several decades these parties have represented the opposite extremes of the sectarian political spectrum. Now they are implanted together in government. For a growing number of the supporters of both these parties the relationship between their leaders and the former sworn enemies they once publicly reviled has been all too friendly and for no tangible benefit. The power-sharing Executive, up and running for just under a year, has produced only more of the same; there has been a continuation of the pro-business agenda of the outgoing New Labour Direct Rule Ministers, but with an added ingredient of nepotism and sleaze. Sinn Fein and DUP ministers are visibly uncomfortable whenever they are challenged on issues like privatisation, education cuts, health cuts and, of course, water charges. They much prefer to debate on familiar sectarian territory. Both these parties would be happy to endlessly discuss whether the SAS or IRA martyrs should be commemorated, knowing that, on these issues they are on solid ground with their own support base. They deliberately revert to such issues in order to throw dust in the eyes of working class people and to deflect attention from what they are up to in government. These parties are themselves no mean hands when it comes to the age-old tactic of imperialism, of divide and rule. When they do invoke the past it is their version of history that is presented. Invariably this is a one sided version; the distorted picture that comes from looking at things through a sectarian prism. So with Sinn Fein’s account of Gibraltar and what followed. In the immediate aftermath of the Gibraltar shootings the Thatcher government and its security chiefs issued a deliberate smokescreen of lies to try to cover up what had happened. The British press faithfully and uncritically regurgitated this tissue of lies as fact. News bulletins and front page articles all told the same story: the three victims, Sean Savage, Dan McCann and Mairead Farrell were killed by Gibraltar police after they had planted a massive bomb; the three were armed; they ignored warnings; shots were exchanged ending in all three being shot dead. The army, so the story went, then defused the bomb. There was no gun battle. Other articles in this supplement go on to record the violent aftermath to Gibraltar – the attempts by the RUC [Royal Ulster Constabulary – now replaced with the PSNI], just over a week later, to hijack the hearses bringing the three bodies back to West Belfast so that they would not pass the waiting crowds; the shooting dead that night of an IRA volunteer, Kevin McCracken, who was preparing to open fire on soldiers in the Turf Lodge area, where Sean Savage had lived; Michael Stone’s attack, two days later, in Milltown; and, finally, the killing of the two “undercover” soldiers who had driven at speed into the funeral of Milltown victim, Kevin Brady. What they say is accurate but only in so far as it goes. The sole intention is to remind people in Sinn Fein strongholds, like West Belfast, of the repression they suffered at the hands of the army, the RUC and loyalists and to bolster their party’s flagging authority by reaffirming the sacrifices made by republicans in resisting this oppression. Anything that does not fit comfortably with this scenario is omitted. What emerges is a partial and one-sided picture, presented without any attempt to analyse what happened or draw any lessons. Those who fail to learn the lessons of the past, especially of past mistakes and of actions that went wrong, are more often than not doomed by history to repeat these mistakes. Gibraltar and its bloody aftermath was the ’Troubles’ condensed and is rich in lessons. Two decades on, it is important that the new generation, standing on the threshold of a new wave of upheaval, move beyond the one dimensional history provided by Sinn Fein – and by all other sectarian forces – and base themselves on a fully fleshed out understanding of important events such as this. Gibraltar, first and foremost, exposed the ruthless nature of the British ruling class. It ripped aside the democratic veil and gave a glimpse of the methods the British establishment is prepared to use to protect its interests. During the 1980s, the Thatcher government adopted a conscious ’shoot to kill’ policy, using the SAS and specially trained units of the police in Northern Ireland to systematically eliminate members of the IRA and other republican groups. Ten months before Gibraltar, a small County Armagh village had witnessed a striking example of this military ruthlessness. An SAS ambush wiped out an IRA unit who were preparing to attack the police station in Loughgall. Eight members of the unit were cut down as they stepped out of a van into a withering barrage of gunfire. A passing motorist who was unfortunate enough to be driving behind the IRA van was also caught in the hail of SAS bullets and killed. Exactly the same methods were used in Gibraltar. The movements of the three IRA members were well known to the British and Spanish police who had been monitoring them for months. The State intelligence services also knew that no attack was planned by the IRA on the day of the shootings; the intended target was to be the changing of the guard ceremony outside the Governor’s office two days later on 8 March. The purpose of sending a special SAS unit, which was flown in for the attack and then flown out, was not to thwart the attack – that could have been done by the Spanish or Gibraltar police – and it was certainly never about arresting anyone. It was to make sure that Mairead Farrell, Dan McCann and Sean Savage did not leave Gibraltar alive. The SAS orders were sanctioned at the highest levels of the Tory Government. Thatcher herself was well briefed on the operation and did not hesitate to in putting all democratic niceties to the side. The story, no doubt concocted in advance, which was immediately issued to the media by the Tory government, was a piece of deliberate misinformation that bore no relation to what happened that day. It was a fabrication that could not hold together for long – not even Thatcher could stick to the line that a bomb had been planted and defused when it soon became clear that there was no bomb in the car that Sean Savage had parked before he was killed. So new lies were added to try to patch up the holes that were appearing in the original story. The SAS, it was said, opened fire because they “thought there was a bomb” and because their three victims made “threatening movements” “when challenged” which they believed could have been attempts to detonate the bomb by remote control. Unusually for such a secretive force, SAS members gave evidence at the Gibraltar Inquest; speaking from behind screens to hide their identities. One of the SAS squad explained that he had seen Sean Savage park a car, which he presumed to contain a bomb. Savage then met up with the other two IRA members and set out to walk to the Spanish border. The SAS member claimed that he had then inspected the car and could not reassure himself that there was no bomb in it. If the SAS story were true and they really had been concerned that the car contained a bomb that could have been detonated remotely, the first thing they would have done before confronting the three IRA members would have been to seal off the area around the car. No steps were taken to do so and no explanation for this failure was ever given. Only one conclusion can be drawn from this – the SAS knew there was no bomb and, in any case, were aware that the IRA would not have used a remotely controlled device to carry out an attack of this nature. That would have meant having to stay in Gibraltar to trigger the explosion, knowing that the borders would likely have been immediately closed, meaning almost certain capture. The accounts given by the few eyewitnesses to the shootings confirm this. According to their evidence, there were no warnings, no threatening gestures, just a fusillade of bullets from the automatic pistols of the SAS. One eyewitness saw Sean Savage already lying prone on the ground with an SAS man standing over him firing bullets into his head. Forensic and scientific evidence gave further proof. The three bodies were hit 27 times; shots fired to the body and then to the head, clinical killings professionally carried out. Sean Savage was hit 16 times, including four bullets to the head. Even the state pathologist, Professor Alan Watson, described it as a “frenzied attack”. The State could only get away with such methods because many people were prepared to shrug their shoulders, so long as it was the IRA or groups like them who were on the receiving end. This is one example of how the methods of individual terrorism, applied by the IRA, among others, ultimately play a reactionary role. Individual terrorism, like the more recent phenomenon of indiscriminate mass terrorism carried out by Al Qaeda, disorientates and confuses the working class. In setting out to weaken the State it invariably does the opposite; it provides the State with an excuse to introduce an array of repressive measures that, under other circumstances, would have been met with widespread opposition. 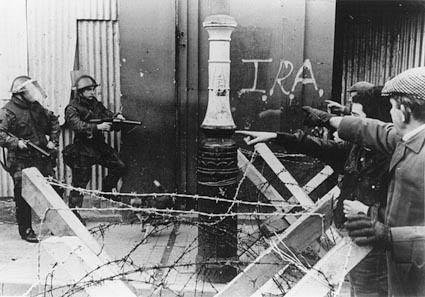 More than this, the shooting of unarmed members of the IRA in broad daylight in the streets, the sealing off of airports with armoured vehicles, or other such measures, all carried out under the excuse of a “terrorist threat”, allows the ruling class to psychologically prepare the population for the possible more generalised use of such measures in the future. Repressive laws and repressive methods, no matter on what pretext they are introduced, are, in the final analysis, a weapon that will be preserved for future use against the working class, particularly against those fighting for a socialist future. 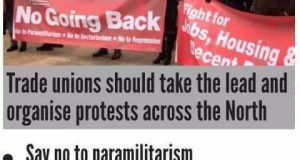 This is one reason why socialists have a responsibility, and a vested interest, to rigorously oppose repression – not to adopt the standpoint of the leaders of the labour movement in Northern Ireland who ignored, or worse supported, the repressive measures introduced by successive British governments since the start of the Troubles. For decades Northern Ireland was used as an open-air laboratory by the British ruling class in which they could perfect methods of policing and crowd control for future use against the British working class. In 1984 and 1985, the British miners were given a taste of militarised policing methods that had been first honed to perfection on the streets of Belfast and Derry. Individual terrorism creates a climate in which such repression can be used. Any account of the Gibraltar killings that deals only with the role of the State and has nothing to say about what the IRA unit were doing there, is therefore one sided and distorted. When the gaps are filled in a fuller picture emerges which, as well as demonstrating the ruthlessness of the State, shows also the futility and, from the standpoint of the working class, the completely counter-productive nature of the IRA campaign. Sinn Fein’s commemorative supplement says their three volunteers were “on active service” but it offers not a single word of explanation about their mission. To say, as this supplement does, that “there was no bomb” is to finish in mid-sentence. To be completely accurate, it should have said there was no bomb “in Gibraltar”. However, just along the Spanish coast, in the resort town of Marbella, there was a second car packed with 141 lbs of semtex with a timing device, its the clock set for 11.20am, but which was not yet activated. 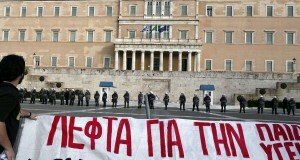 It is clear that the intended target was the changing of the guard ceremony two days later. The car parked by Sean Savage in Gibraltar was put there to reserve a parking spot and, had things gone to plan, would have been replaced, shortly before the ceremony – which was due to end at 11.20am – by the car containing the bomb. It was to have been a no-warning bomb. Had things gone according to plan, the three IRA members would have been in Spain at the time of the explosion and would have had no idea who may have been standing around the car. The most likely outcome would have been horrific carnage, with members of the army band, but also bystanders and spectators (men, women and children), killed and maimed. It would have been a propaganda disaster for the republican movement. Images of dead and injured civilians would have been used to stir a backlash against the IRA, not just in Britain and Ireland, but across Europe. We can be sure that, had the Gibraltar bomb gone off as intended, and had the three IRA volunteers returned safely to Ireland, there would have been no 20th anniversary commemorative supplements, marches or meetings. Four months before Gibraltar, on 8 November 1987, the IRA carried out an operation that, from in terms of its objective, was a complete success. A bomb exploded at its target killing 11 people and wounding 63 others, some suffering severe injuries. One eventually died after spending 13 years in a coma. Those who planted this device escaped unscathed. To this day, they have never been caught. This was the poppy day atrocity, in which a bomb, planted near the cenotaph in Enniskillen, was set to go off while crowds were gathered there for a Remembrance Day service. To those who planted the bomb it may have been a success; but in every other sense Enniskillen was a disaster, not just for the families who suffered, but a disaster also for the republican movement, even opening up divisions in the IRA. Not surprisingly, the 20th anniversary of the Enniskillen atrocity passed last November without any Sinn Fein organised commemoration. Enniskillen, like Gibraltar, showed how, after nearly two decades of armed struggle things were now stood on their head for the IRA: “success”, Enniskillen-style, meant failure and a loss of support, while Gibraltar-style failure became success. The “armed struggle” was at an impasse. Even the unusual events in Andersonstown, when the two army corporals drove into the funeral of Milltown victim, Kevin Brady, showed how, more often than not, IRA actions had become counter-productive. With the memory of what had happened in Milltown fresh on everyone’s mind, those attending the funeral were already on their guard. When the soldiers’ car drove at the front of the funeral procession, turned into a side street, only to find it was a dead end, and then reversed at speed into the middle of the funeral cortege, those people on the spot naturally assumed this was another attack and acted accordingly. Their suspicions appeared confirmed when one of the soldiers produced a gun and fired a warning shot. The soldiers were quickly overpowered, disarmed and dragged from the car. If they had been taken, questioned but then released, the whole spotlight of media attention in Ireland and in Britain would have been on what the soldiers were doing there. Was the army version; that they had taken a wrong turn and found they were in Andersonstown by accident, really what happened? Or, were the British soldiers, as the IRA claimed, there on an undercover operation? Had there been a similar operation three days earlier at Milltown? Had there been collusion between the military and loyalists in the attempt to target leading republicans? These are some of the questions that the corporals would have faced and their answers just might have lifted the lid a little on the dirty war that the State was conducting behind the scenes. What these soldiers were doing at that funeral has never been properly explained, certainly not by the military. We may never know the truth because the IRA quickly intervened and within minutes of finding the corporals’ military ID the IRA bundled the soldiers away and shot them. This “execution” actually did the British military tops a favour. It switched the spotlight of attention away from what the soldiers were doing at the funeral, and from whatever military bungling had placed them in a position to be exposed, disarmed and captured, and, instead, placed it firmly on the brutality of the IRA in executing captives who had been not only disarmed but beaten to a point of helplessness. In a statement issued at the time, the IRA, incredibly, tried to claim the high moral ground by distancing themselves from the beatings the corporals received. They offered a terse “justification” of their own actions that, far from being reassuring, was chillingly reminiscent of the clinical approach to killing of the SAS. Their statement concluded: “Despite media reports, we are satisfied that at no time did our Volunteers physically attack the soldiers. Once we confirmed who they were, they were immediately executed”. The IRA’s military campaign, had, by this point, run out of momentum. During the 1980s they had received four huge shipments of arms and explosives from Libya – including the plastic explosives found in Malaga. The IRA was armed to the teeth with an arsenal of weapons that were later to be bartered for political favour. But, long before the IRA decided to put these stockpiles “beyond use”; they had no possible way or putting them into use. Militarily, the IRA was contained. The idea, sold to IRA Volunteers in the early 1980s, that the Libyan arms would allow them to conduct a major offensive, was never put into effect, and never could have been. Any escalation meant greater exposure and greater risk. By this stage, the British army had both the military means and the intelligence to counter anything the IRA might attempt. The IRA’s “big push” ended before it could properly begin – in the SAS killing zone at Loughgall . By the time of Gibraltar, the IRA leadership were only too aware that their military campaign could not succeed in defeating the British State. Their 1970s language about “imminent British withdrawal” had long been abandoned. The Republican leadership had already stumbled on a political strategy; more and more effort was being put into the building of their political wing, Sinn Fein, and correspondingly, whether they liked it or not, there was less emphasis on the military struggle. Within the IRA there was suspicion that some of the leadership were going soft on the “armed struggle” and dissent at the growing emphasis on politics. Dan McCann was one of those in opposition to the Adams leadership on this issue. He had left the IRA for a time and was only persuaded to rejoin not long before his ill-fated mission to Gibraltar. In public, the Republican leadership had to maintain the line that victory would eventually be won by military and, now also, political means, but it was a half hearted message. The confident language of the 1970s about “imminent British withdrawal” jarred with the new circumstances and had long been abandoned. When IRA Chief of Staff, Martin McGuinness, spoke at the anniversary of the Loughgall massacre, he still talked of the eventual defeat of the British forces by “military” and “political” means. The graves that he was standing over, of the IRA unit wiped out by the SAS, sent out a different message. McGuinness added a qualification: “But in saying that I am not saying that the IRA have the ability to drive every last British soldier out of Derry, Armagh, Down or anywhere else. But they have the ability to sicken the British forces of occupation.” It would have been more truthful to acknowledge that, by this stage, the IRA was barely capable of irritating, let alone “sickening”, the British army. The changing nature of the conflict had another unwanted aspect for republicans. British policy, for some time, had been to bring about the “Ulsterisation” of the security forces; similar to the “Iraqis take the lead” policy of the US in that country, except it was much more successful. Much of the front line military activity in Northern Ireland had been handed over to the locally recruited, and overwhelmingly Protestant, Ulster Defence Regiment (UDR). As a result of this and of their overall military advantage, the numbers of British soldiers killed had fallen to levels that would hardly turn a hair among the military top brass. Nine were killed in 1984, two in 1985 and four in 1986. This, plus the fall in the overall death toll due to the Troubles, meant that the British aspiration, blurted out at a 1971 press conference by Tory Home Secretary, Reginald Maudling, of reducing violence to “acceptable levels” had, by and large, been achieved. For republicans, the unwanted side effect of Ulsterisation was that it was now members of the UDR, as well as the RUC, who were the first on the IRA target list. This inevitably added a new sectarian edge to the IRA campaign. In fact, the campaign had been sectarian in effect, and sometimes also in intent, from the very outset. For example, among the first wave of bombings in the early 1970s, were no warning attacks on pubs in Protestant working class districts. However, the vast majority of the young people who flocked to the IRA, at that time, joined because they saw the struggle as one against the State and did not want to get embroiled in a sectarian conflict. The Ulsteristation policy meant that, by the 1980s, instead of killing “foreign” British soldiers, they were, in the main, targeting and killing local Protestants. Many of these were part timers who were attacked when they were off duty, often when they were at work or on their way to and from work. No matter what the intent, to the majority of Protestants these were sectarian attacks. In rural areas, where many of the victims were local farmers, these attacks were seen as proof that the IRA was conducting a genocidal campaign to drive Protestants from their land. There were two deaths, post Gibraltar, which did not get a mention in the Sinn Fein commemorative material. In one case, this is because it was a killing that republicans would prefer people were not reminded about. On 18 March, the day before the two British army corporals were shot dead in Andersonstown, a young Protestant woman, 21 year old, Gillian Johnston, was sitting with her fiancé in her car in the small village of Belleek, County Fermanagh, when the IRA opened fire on them. She was killed and her fiancé wounded. The IRA immediately issued a statement saying that the killing was a mistake and that her brother, who they claimed was a member of the UDR, was the intended target. The family quickly contradicted this statement, pointing out that they had no family members in the UDR. To local Protestants, this was further evidence of republican double standards. The IRA condemned the British government for issuing lies to cover up what they had done in Gibraltar. Yet their immediate response to this killing was to issue a statement that was just as untrue. The IRA had condemned the “rules of war” that allowed the SAS to execute “unarmed volunteers” in Gibraltar. Yet, a few days later, their justification for killing Gillian Johnston was that they were trying to kill a UDR man who, in all probability, would have been unarmed. More than that, the three killed in Gibraltar were “on active service”; the supposed target in Belleek was off duty. The Troubles, by the mid 1980s, were increasingly turning into a low intensity sectarian war of attrition with the conflict between republicans and the State receding to the background. Loyalist paramilitaries, whose main business was random sectarian killing, were accounting for an ever-greater percentage of the overall death toll. By the early 1990s, they were starting to outgun republicans; able to make the grisly claim that more people died at their hands than at the hands of the IRA. In the days following Gibraltar, there was a typical example; this was the second killing not mentioned in the Sinn Fein material. On 15 March, the day after the bodies of the three SAS victims had returned to Belfast and on the eve of Michael Stone’s Milltown rampage, a young Catholic shop worker was shot dead in South Belfast. 25-year-old Charles McGrillen was shot dead by the Ulster Freedom Fighters, another name for the Ulster Defence Association (UDA), at the Ormeau Road branch of Dunnes Stores where he worked. His death highlights another side to the Troubles that virtually every commentator and historian, and of course all the sectarian propagandists, systematically overlook – the importance of the labour movement. Charles McGrillen was a T&GWU shop steward and a trade union activist. His murder was not just an attack on Catholics; it was an attack on trade unionists and on their ability to organise without threat. It demanded a response from the trade unions, as a whole. Instead, the union leaderships, including the leadership of Charles McGrillen’s union, the T&GWU, sat on their hands and maintained an undignified silence. This was typical of the role – or lack of a role – of the union leaders throughout the Troubles. The paralysis at the top of the unions meant that rank and file trade union members felt powerless in face of seemingly invincible sectarian forces. Yet the enormous power possessed by the working class had been demonstrated across Northern Ireland just twenty four hours before Charles McGrillen’s murder. As the bodies of the Gibraltar victims were on their way back to Belfast, tens of thousands of workers, Catholic and Protestant, gathered at Belfast City Hall and at other venues across the North, to protest against attacks on the Health Service. 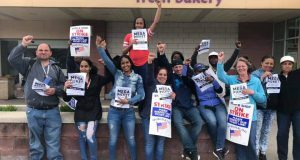 Even with no clear call for strike action from the union leaders this, in effect, turned into a partial general strike, with industries forced to shut down as their workforces marched to join with health and other public sector workers at the rallies. In Belfast, shipyard workers filed out of Harland and Wolff, met other workers from the East Belfast Harbour estate and marched to the City Hall. Workers from the Royal Victoria Hospital and other West Belfast workplaces marched to join them. So it was across the city. You will not find a single mention of this protest in any of the scores of histories of the Troubles that deal with this period. Yet during these days of mass upheaval, of huge funerals and of thousands lining the streets to await them, the largest demonstration, by far, was this mighty display of class unity. It was a potent demonstration of the power of the working class but, when it came to combating sectarianism or resisting State repression, the absence of any lead from the heads of the unions meant that this remained largely a latent power. Shop stewards and rank and file activists, especially members of Militant (forerunner of the Socialist Party), were beginning to organise strikes and protests against the killings, but not enough pressure had yet built on the union leaders to force them to call the huge strikes and rallies that just a few years later would bring tens of thousands onto the streets demanding that the paramilitaries call a halt and which would be a key factor in forcing them to call off their campaigns. From a working class point of view, the real history of the Troubles to this point had been one of missed opportunities that then turned into setbacks; all down to the complete lack of response by the tops of the trade unions to the mighty events that would reshape Northern Ireland’s history. After Gibraltar they let another opportunity to challenge the sectarian forces pass them by. They had nothing to say about the killings that the Thatcher government had ordered in Gibraltar. Their silence gave Sinn Fein and the republican movement a clear field to tap into the anger that swept Catholic communities and also to ensure that the opposition to these killings remained one sided, confined to those communities. One thing the republican movement cannot be accused of is inertia. They responded swiftly and energetically to the news of the death of three of their activists in Gibraltar. They mobilised their support base and made what political capital they could from these deaths. Contrast this to a trade union leadership who could bring tens of thousands onto the streets to protest health cuts but, one day later, did nothing when one of their own activists was gunned down by the murderous and notoriously sectarian South Belfast UDA. Had they responded with one tenth of the initiative and energy that republicans had shown to further their cause, they could have, for example, closed supermarkets and organised a massive demonstration of united working class anger to coincide with Charles McGrillen’s funeral. And, had they done this, they would have been duty bound, but also well poised, to organise a similar protest three days later when the IRA murdered Gillian Johnson. The working class could have emerged from all this upheaval strengthened, having struck a blow against the sectarian forces on both sides. Instead, the union leaders squandered the opportunity and the republican movement was, and is still, able to make capital out of events that, on proper examination, show the bankruptcy of their methods. What happened after Gibraltar was the real story of the Troubles to that point; a long litany of opportunities missed because of the head in the sand attitude of the trade union leadership. Twenty years earlier the labour movement could have steered history in an entirely different direction if it had spearheaded the campaign for civil rights, had fearlessly resisted the oppressive response of the Unionist State and if it had linked these struggles with a fight for jobs, decent homes, adequate wages and services for all workers, Catholic and Protestant. Had it done so, the Labour Movement would have offered a more natural political home and a better method of struggle to the generation of Catholic youth who out of anger and frustration would eventually move behind the IRA. The trade union leadership chose instead to stand aside issuing pleas for calm that, in effect, were little more than tacit support for the supposedly more “moderate” and “reforming” sections of the government. The fledgling Northern Ireland Labour Party, which during the 1960s had had the potential to develop into a mass political force, performed even worse, quickly adopting a sectarian pro-unionist standpoint. It fell to pieces as a result. Their real message was really just a spruced up version of the old idea that had plagued Irish politics since the War of Independence, the view that “labour must wait”. First, all nationalists, left and right, business owners and workers, large farmers and farm labourers, must unite to end partition and reunify the country; then and only then can the fight for socialism begin. Since there was never any possibility of overcoming Protestant resistance, especially the opposition of the Protestant working class, to a capitalist united Ireland, socialism would always remain the music of a distant future that could never be reached. Those who joined the IRA signed up, not only to a military campaign that could not succeed but also a political ideology that, at heart, was just the same old right wing nationalism, served up in a new dish. At least the old right wing Southern-based leadership of the 1960s and 1970s did pay occasional verbal homage to socialism. This is more than can be said for those in charge today. The speed at which the current republican leadership have moved to the right would have left even the old guard breathless. Like their ideological soul mates at the head of “New Labour”, Adams and co no longer bother even to pay lip service to socialism, not wishing to do or say anything that might jeopardise them in their bid to become an accepted part of the political establishment. They now openly, enthusiastically and energetically embrace the market and capitalism. A reminder of this dropped through the doors along with their Gibraltar supplement. On the front page of their accompanying newspaper, alongside a picture of Gerry Adams, was an article quoting a speech he gave to a special West Belfast business coffee morning on 14 February: “So let me be very clear Sinn Fein is not anti-business. We are pro business. Sinn Fein want to see businesses thrive. We want to see investment in areas like West Belfast, which have been deliberately neglected for so long.” This is Sinn Fein 2008. It is a far cry from the image of struggle they can now only project by reminding people of how things were twenty years ago. Before they proposed to hold a meeting to celebrate Mairead Farrell’s life in Stormont’s Long Gallery, there was one question that Sinn Fein should have, but did not ask. This was not whether their DUP ministerial colleagues would decide to be offended by the idea. The real question that needed to be posed was this – would Mairead Farrell have wanted to have her life celebrated in that venue? Or put differently, would she have considered the presence of Sinn Fein ministers in a right wing Northern Ireland administration, alongside their one time political nemesis, the DUP, worth the sacrifice of prison, hunger strike and Gibraltar? Of course, Mairead Farrell, had she lived, might have moved along the same rightward trajectory as Adams and the rest of the current Sinn Fein leadership. But we cannot assume that – she died holding views far removed from those advocated by Adams and co today – and they have no right to assume it either. Twenty years on, the real lesson of all that happened at Gibraltar and after is the need to build a fighting socialist alternative to sectarianism and capitalism so that the energies of another generation are not wasted on ideas and methods that can never succeed.